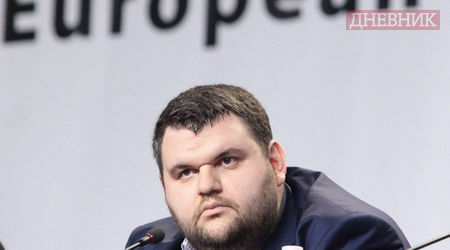 Peevski, 33, a member of parliament from DPS, a political party representing the Turkish minority in Bulgaria, surprisingly announced he would not take his seat, which he ceded to Iskra Mihailova, currently minister of ecology from the same political group. In Bulgaria, Peevski is considered a symbol of the shady power brokerage that has impoverished Bulgarians, and ruined the country’s reputation. Officially, Peevski has no property, but it is widely assumed that he controls vast economic interests, and a powerful media group, which is waging a dirty war against his political opponents. The appearance of Peevski at the press conference following the election was a surprise for many, as the MP avoids contacts with the press. Last June, the Bulgarian parliament voted to make Peevski the head of the country’s State Agency for National Security (DANS). This almost brought down the then two-week old government of Prime Minister Plamen Oresharski, who leads a minority coalition between the Socialists and the DPS. The situation also embarrassed Sergei Stanishev, the leader of the Bulgaria Socialist Party (BSP), who is also leader of the Party of European Socialists (PES) [read more]. Peevski said that he didn’t understand why he was blamed for trying to obtain the DANS seat. He complained that the country’s law-enforcement institutions were “submerged by false signals” against him. The stepping down of Peevski is likely to be a relief for the European liberal family. Guy Verhofstadt, the leader of the liberal ALDE group in the European Parliament, had tried to convince DPS not to include Peevski in the lists [read more]. According to exit polls, the Bulgarian elections were won by the centre-right GERB party of former Prime Minister Boyko Borissov (31.13%). Another centre-right party, the Reformist Block, whose list was led by former EU Commissioner Meglena Kuneva also scored surprisingly well, obtaining 6.43% of the vote. The two centre-right groups are expected to send to Strasbourg 8 out of the 17 Bulgarian MEPs. Kuneva wasn’t however elected as MEP, as the preferential vote gave advantage to Svetoslav Malinov, second in the list. The big loser of the election is the Bulgarian Socialist Party (BSP) of PES President Sergei Stanishev, who obtained 18.85% of the vote and will have 4 MEPs. Third is DPS, with 16.41% and will have 3 MEPs. Asked if he would resign in his capacity of leader of BSP and of PES , Stanishev said he had no such intention. He blamed his political mentor Georgi Parvanov, the former BSP leader, and former President of Bulgaria, for having formed an alternative political force, ABV (Alternative for a Bulgarian Renaissance), and splitting the Bulgarian left. The list of ABV was led by Ivailo Kalfin, a prominent MEP who left the BSP group in the European Parliament over political differences with Stanishev [read more]. But since ABV obtained only 4.1% of the vote, Kalfin will not return to the European Parliament. The threshold to send MEPs was at 5.9%. A new political force will send 2 MEPs to Strasbourg – the party “Bulgaria Without Censorship” of former journalist Nikolay Barekov, who got 10.66% of the vote. Reportedly, this force has sought EPP affiliation, without success. Barekov has failed to provide a credible respond to questions provided about the financial sources of his expensive election campaign. No Bulgarian nationalist party made it to the European Parliament. The party Ataka, who previously had 2 MEPs, obtained only 3.06%. Another nationalist group, the National Front for the Salvation of Bulgaria (NFSB), obtained 3.16%. According to analysts, Ataka has been punished by its electorate for having become a political ally of BSP (see background). Bulgaria's Socialist-led government took office on 29 May, ending months of political impasse but lacking broad backing. Plamen Oresharski, a nonpartisan former finance minister, is prime minister. At the parliamentary election, held on 12 May, the party GERB (Citizens for a European development of Bulgaria) of former Prime Minister Boyko Borissov emerged as the largest party with 97 of the 240 seats. But as GERB proved incapable of finding a coalition partner, the Bulgarian Socialist Party (BSP), which obtained 84 seats, formed a cabinet with the Movement of Rights and Freedoms (DPS), a mainly ethnic Turkish force, which obtained 36 seats. As they control just 120 MPs, the two governing forces BSP and DPS enjoy the tacit support of Ataka, a nationalist and xenophobic force, which obtained 23 seats. Dnevnik, the EURACTIV partner in Bulgaria: ????????? ??? : ??? ?????? ??????? ?, ??????? ?? ??????? ???? ?????????? ?, ???? ? ????????????? ????? ?????? ?